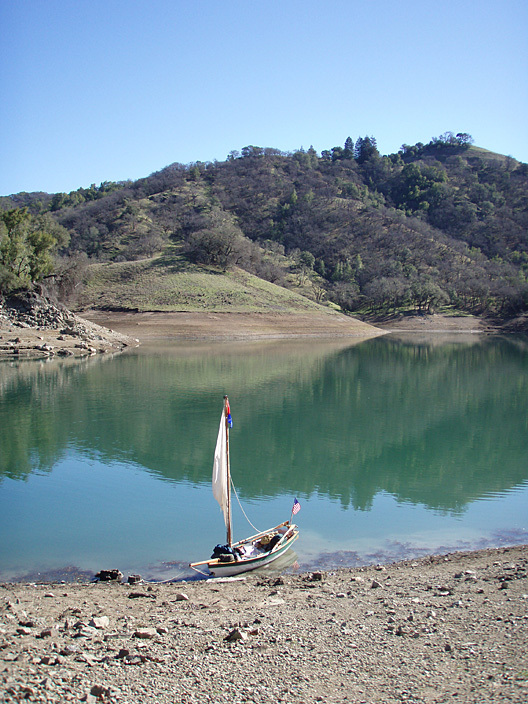 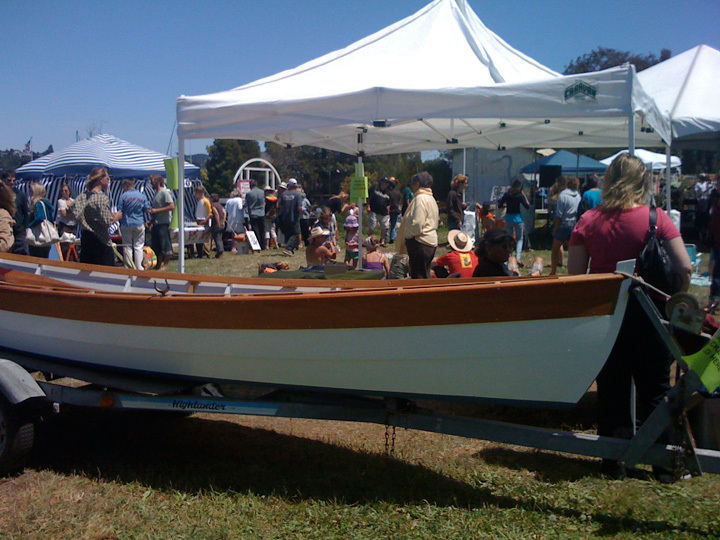 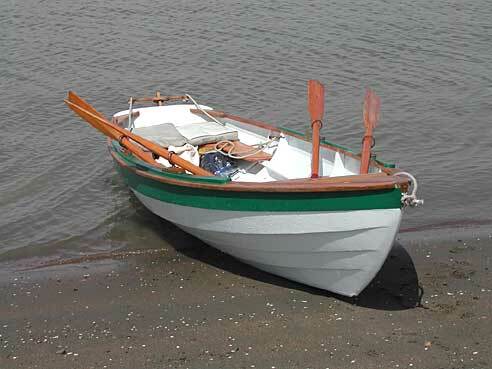 I purchased this 13' 5" Chamberlain dory skiff in San Anslemo in mid-September 2005. 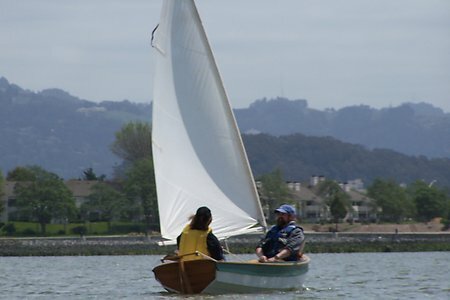 According to the seller it had been built by the SF Maritime Museum's boat-building class in the early 90's, made from solid planks of straight-grained fir attached by copper nails and roves over sawn and steamed oak frames. 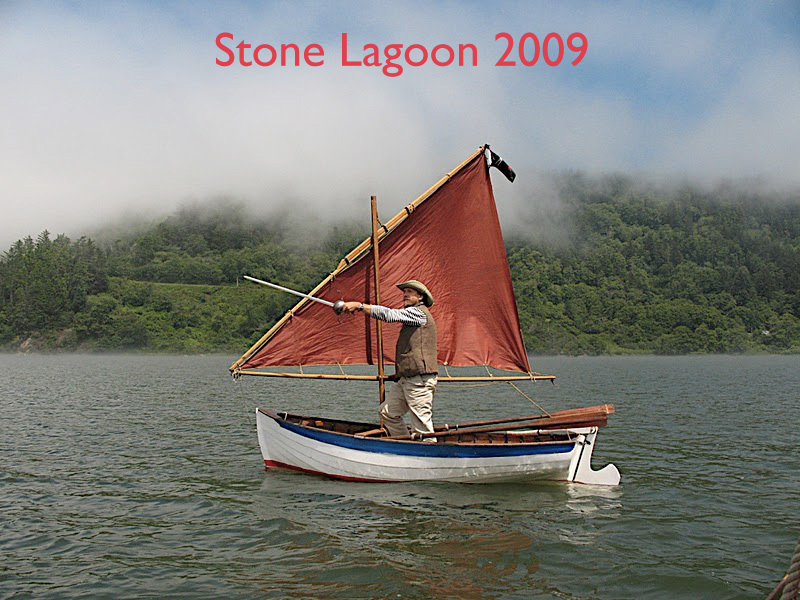 Above are before and after pics from the restoration and rigging for sail. 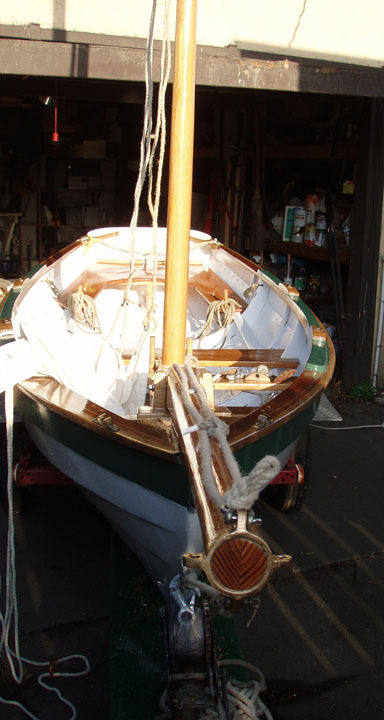 See the Dory Restoration page for more building details. 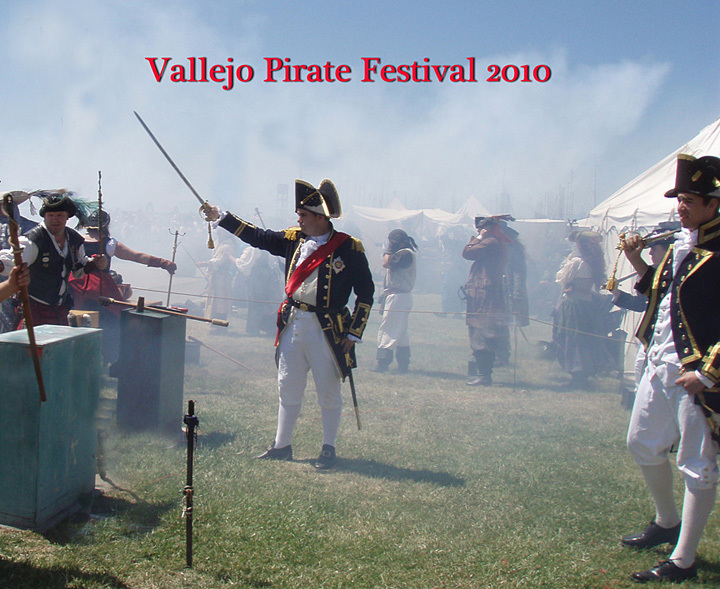 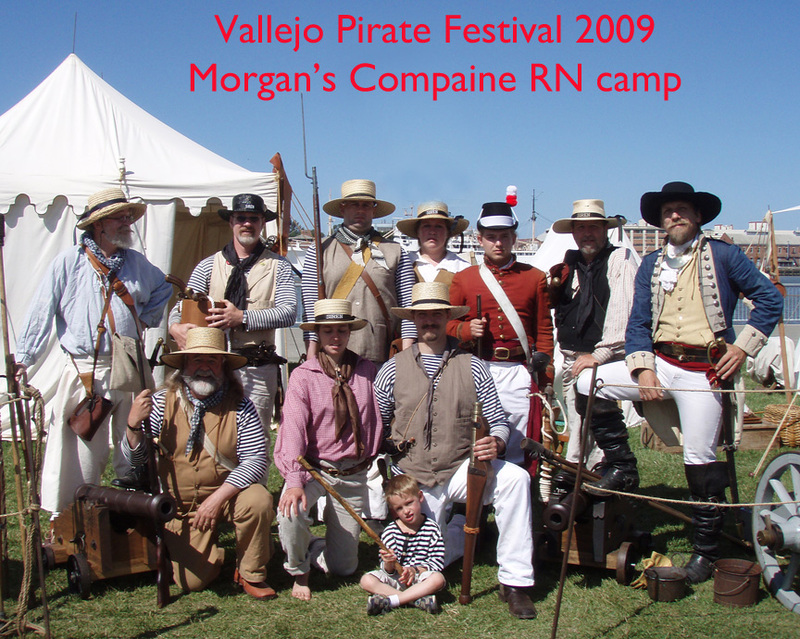 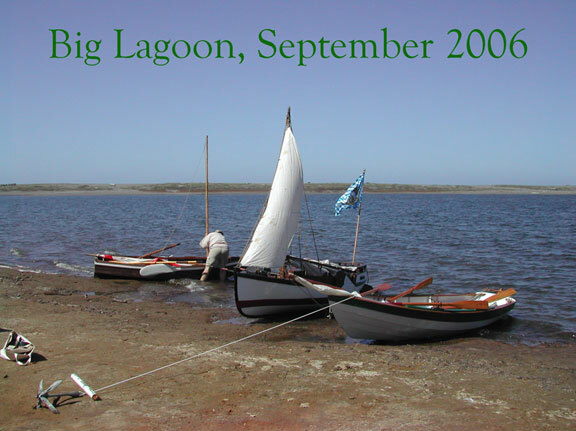 We launched her for the first time on April 22, 2006 after six months of hard work. 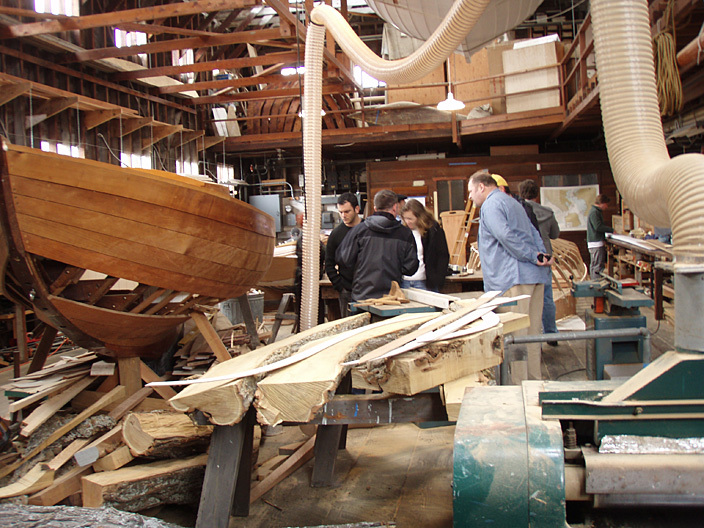 Les Schuldt, a friend from the Wooden Boat Forum and an active wooden boat restorer, is shown here helping with the trailer. 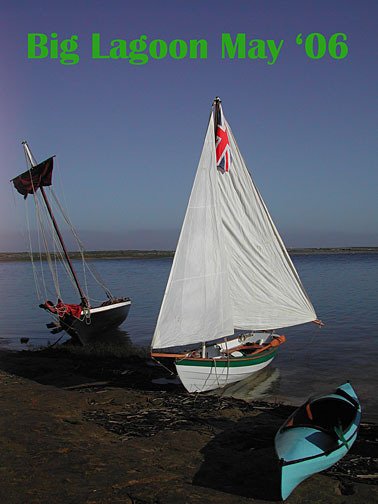 Les' photo album of the launch. 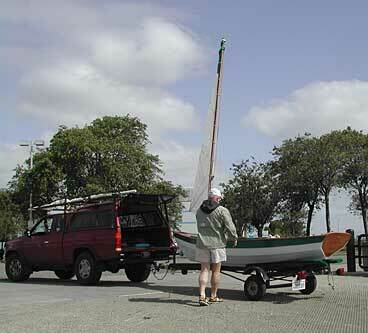 He brought his kayak to take pics from the water. 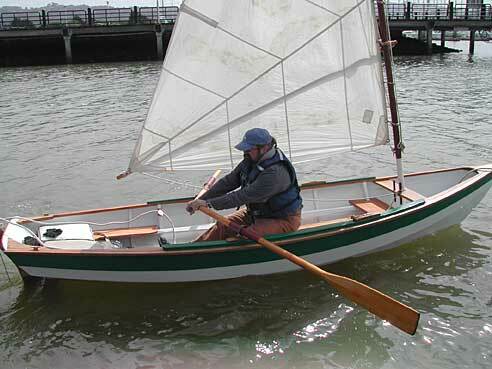 We then got him on board to row and help tweak the two sailing rigs and the yoke rudder setup. 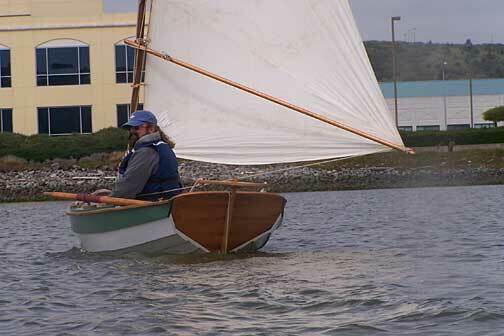 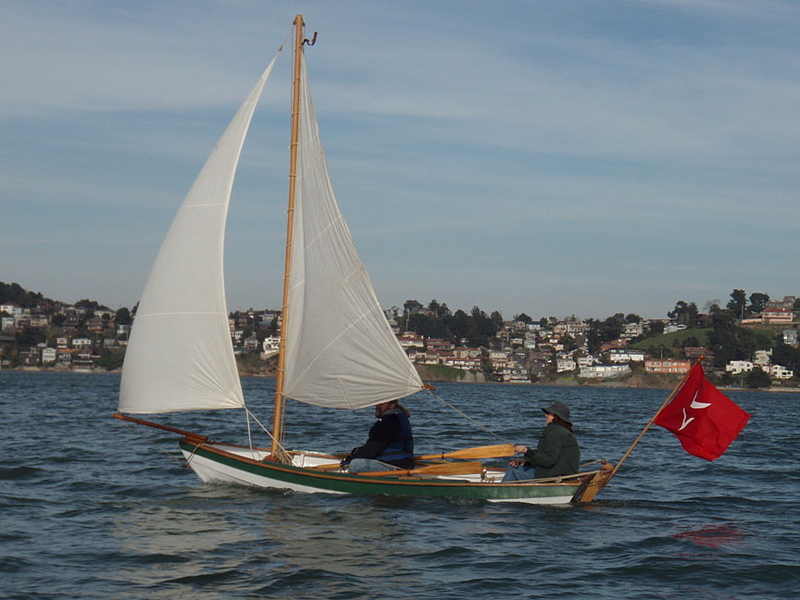 Here is the more traditional sailing rig, with canvas sail, sprit-boom, and oiled mahogany mast. 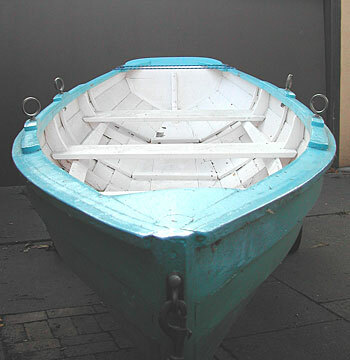 The yoke tiller allows you to sit nearly anywhere in the boat, keeping the trim even whether there is one or three persons aboard. 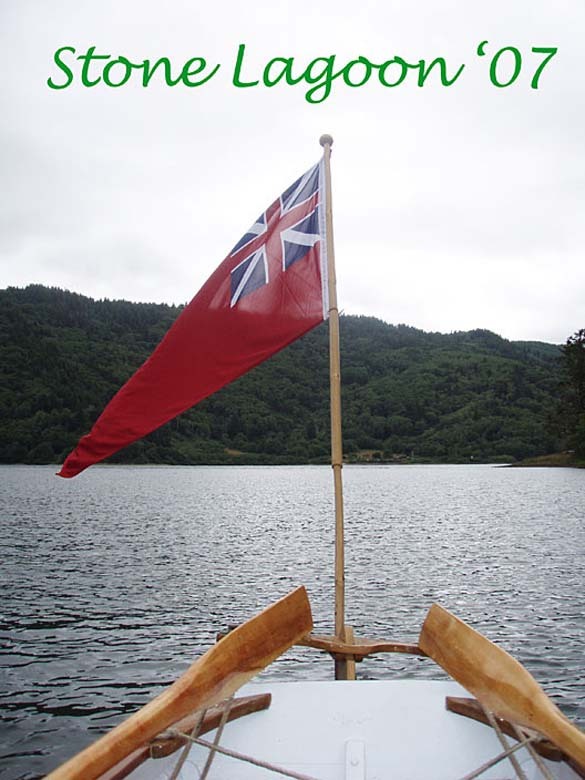 Speaking of three people aboard, the dory rowed and handled surprisingly well with two at the oars and one on the sternsheets steering. 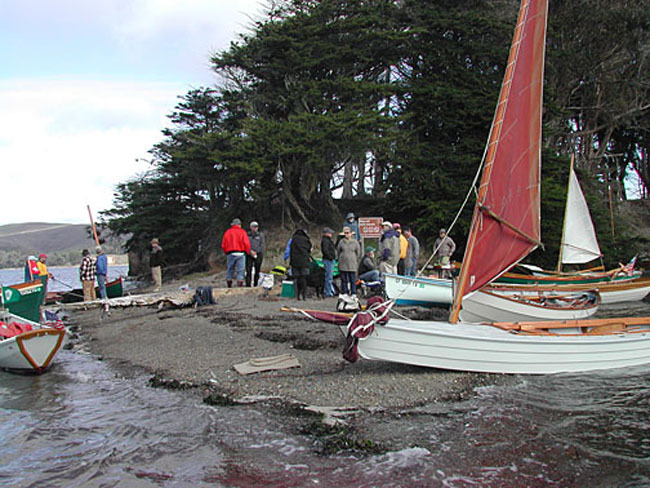 Here she is pulled up on one of the shoreside park beaches near Richmond's Marina Bay. 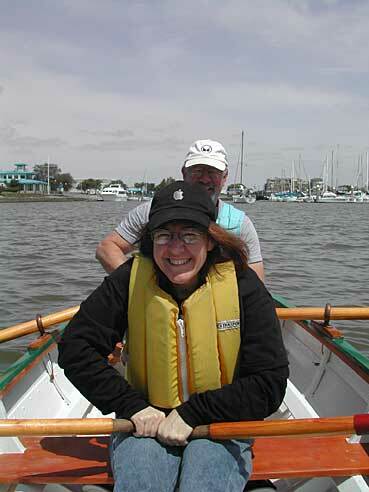 Here are Mary and Les on the oars, while I lounge comfortably in the stern and steer. 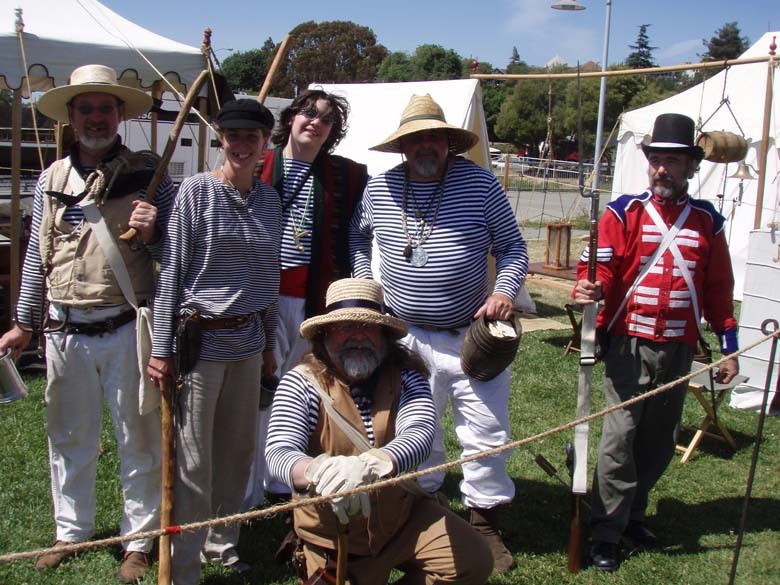 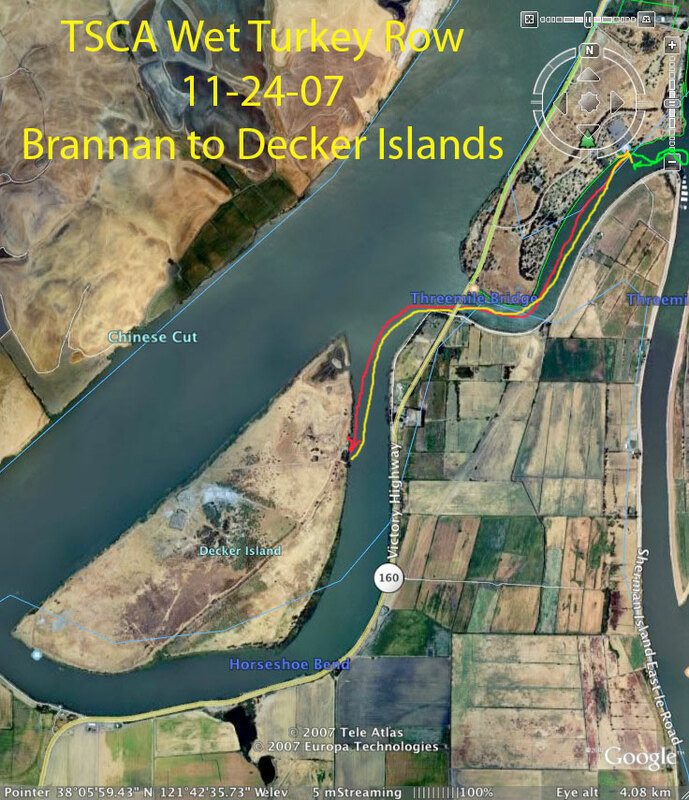 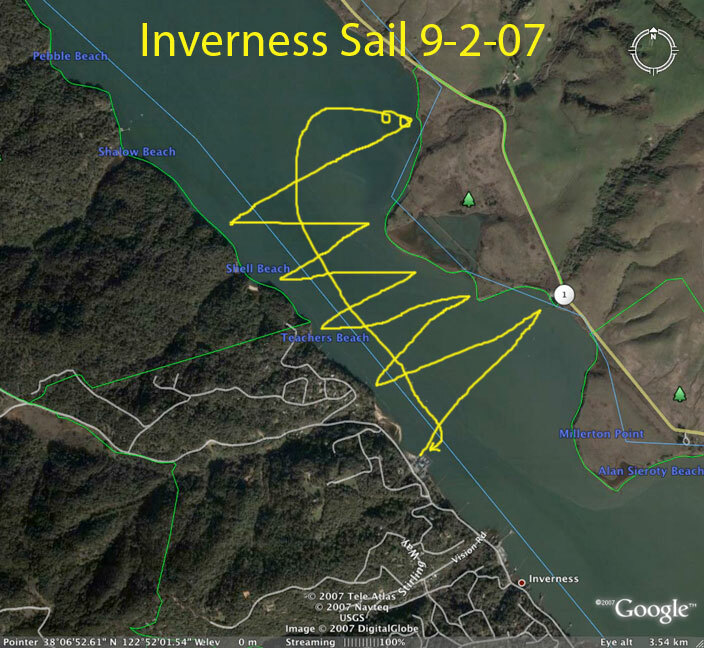 The next Sunday was Opening Day on SF Bay, but I evaded most of the madness and rowed / sailed out to the sandspit on Brooks Island (the island is closed to visitors). 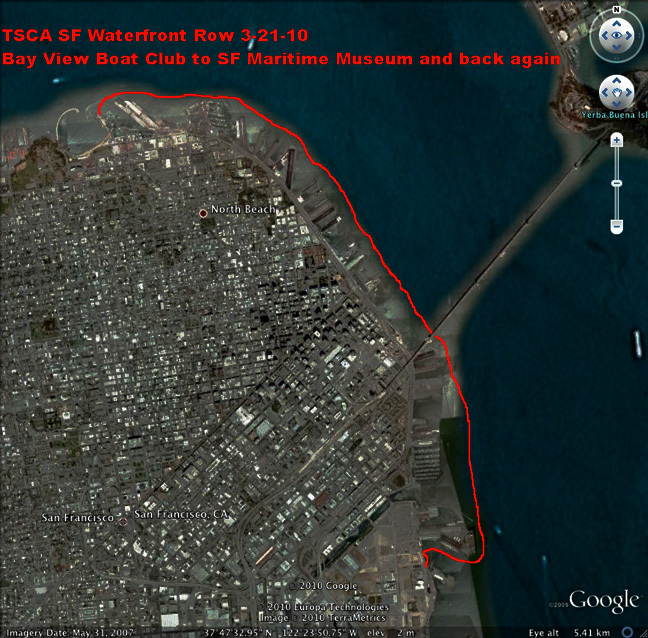 The seagulls were nesting and quite excited by my visit, but I found a great seat with the usual zillion-dollar-view of SF == foggy and windy but still nice. In the other direction Angel Island looms above the fog and wind on the Bay. 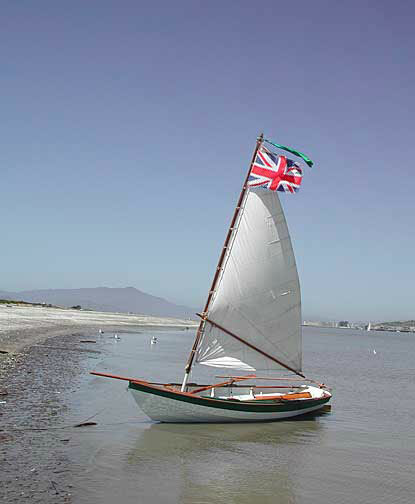 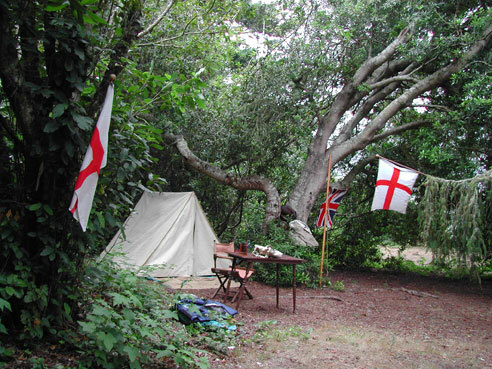 Since it was Opening Day after all, I flew my Union Jack just for the heck of it, but only while on the beach since this wasn't a reenactment. 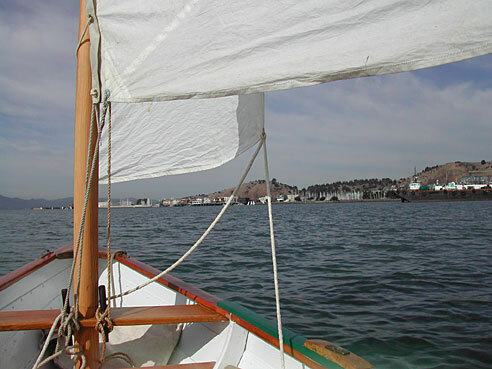 I had a cracking downwind sail back to the Marina docks and ramp -- cracked one of my belaying pins trying to furl the sail. 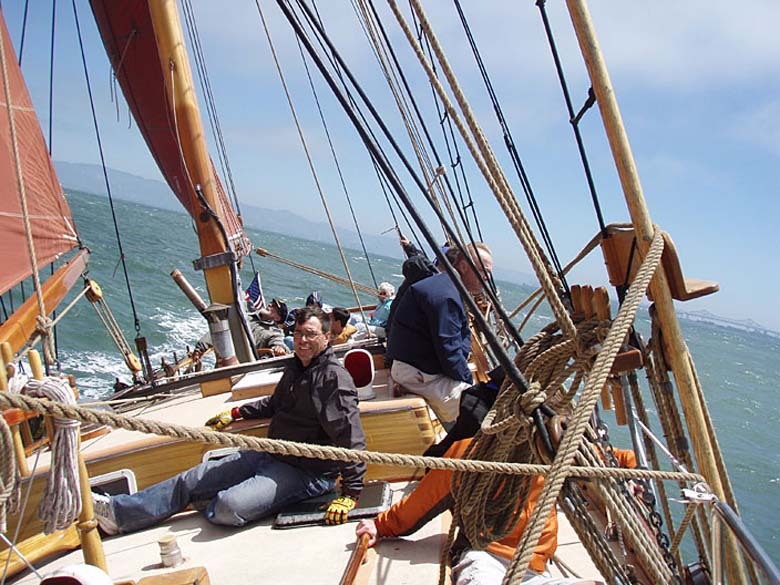 Also managed to wind the mainsheet three times around the bowsprit, much to the amusement of the bystanders. 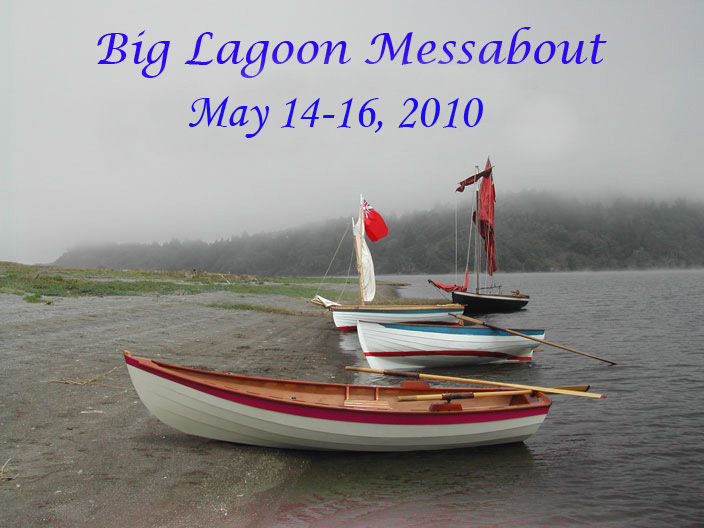 On May 12-14, I trailered her up above Eureka to Big Lagoon, the site of a Morgan's Companie campout and wooden boat event. 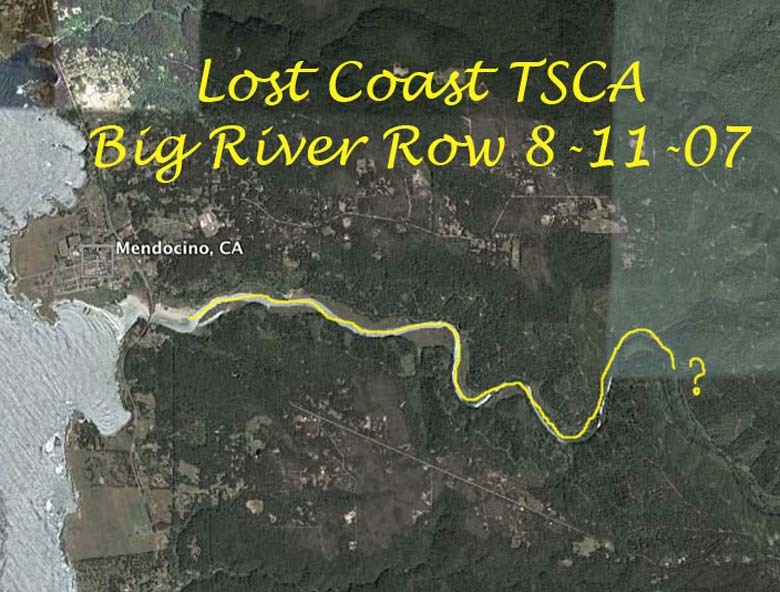 On Saturday, July 8 the TSCA had a row / sail on Lake Natoma, hosted by Sunny & Jim Lawson of Davis. 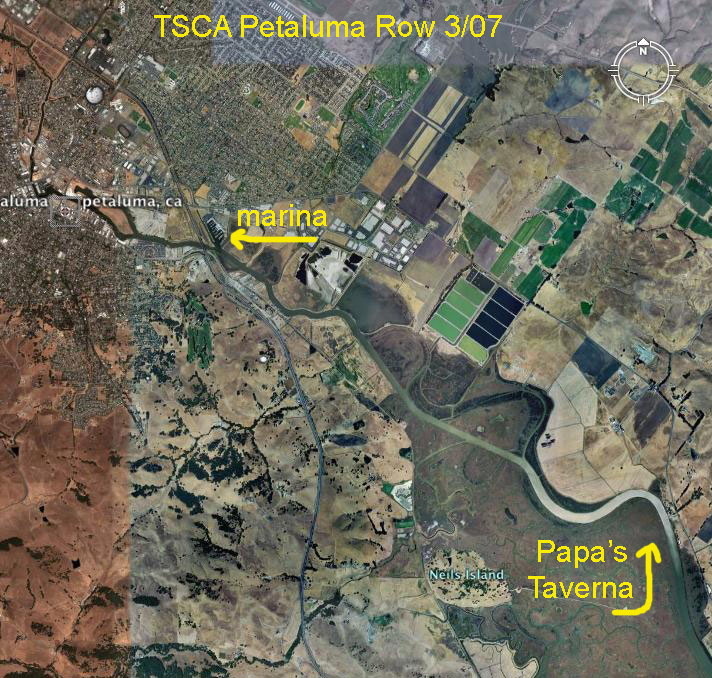 Lake Natoma is just downstream of Folsom Lake, right off Hwy 50 outside of Sacramento. 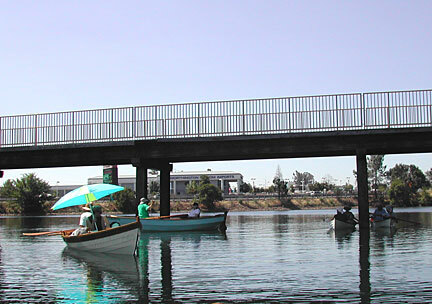 Here the Drascombe explores the very thin water, discovering that we couldn't make it through a passageway normally accessible under the bikeway.Participating boats included a glass Drascombe (smaller than the Lugger), two Rangley-like locally-made boats, a stretched Lowell dory skiff, and my Chamberlain dory skiff.Everyone else took off after lunch, but since I was already launched and rigged for sail, I sailed up and down the end of the lake for several more hours until the sun started to get to me. 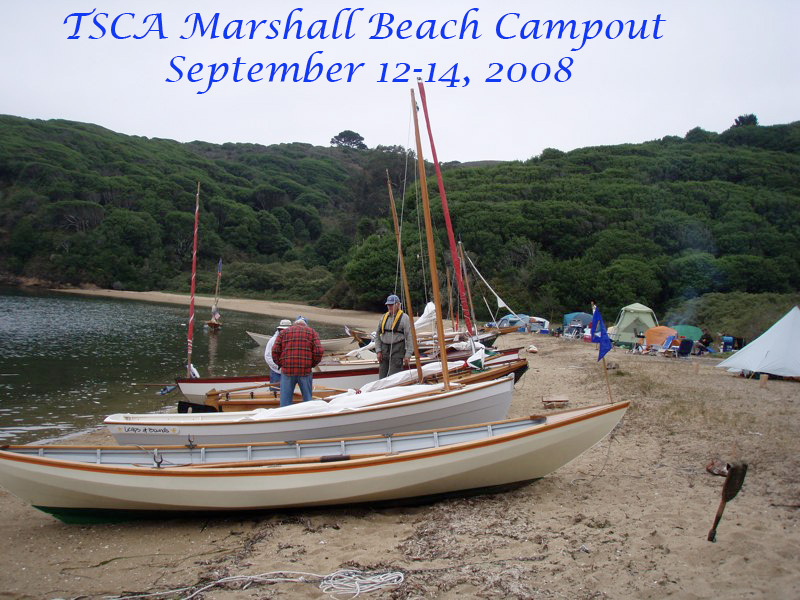 A very nice event! 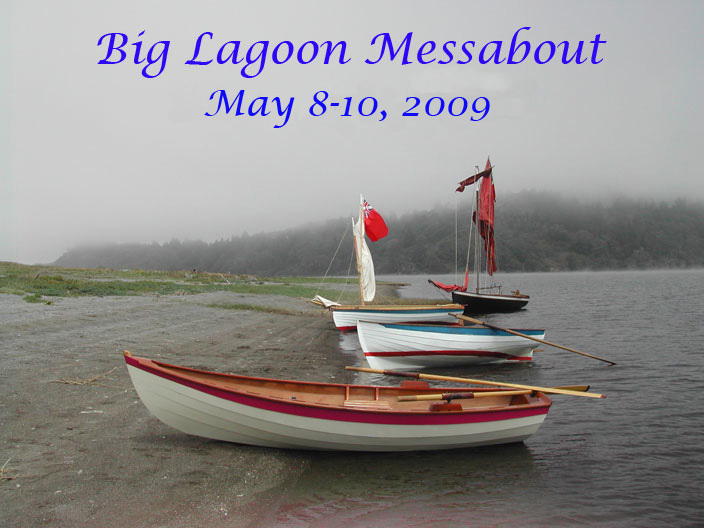 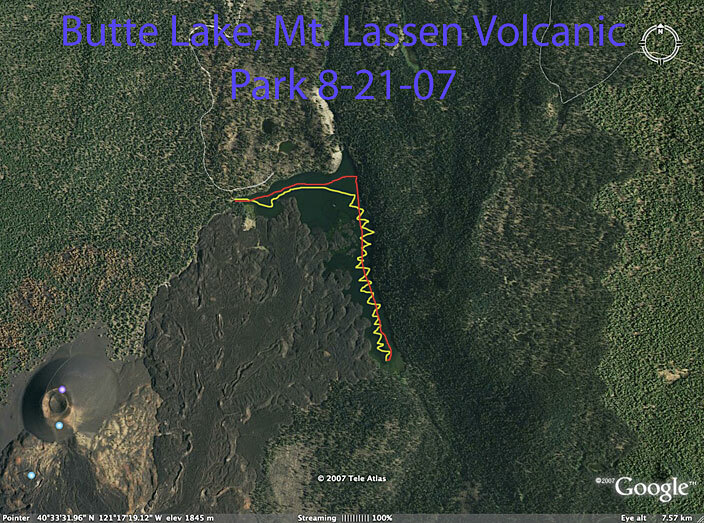 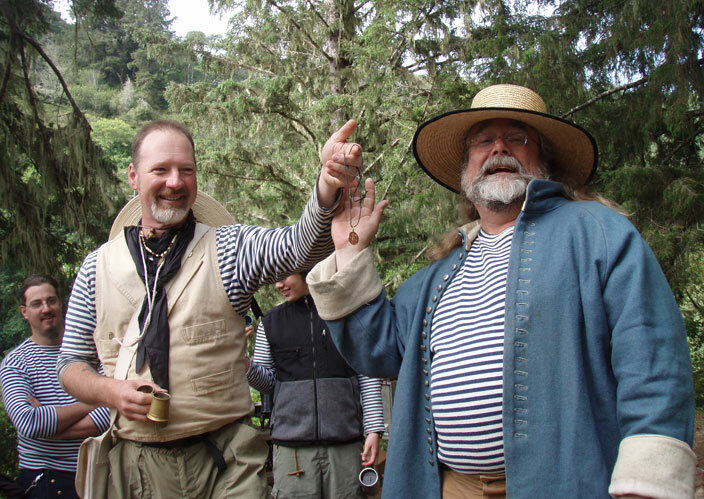 I missed the correct weekend for the Loch Morgan / Stone Lagoon event, but had a great time anyway. 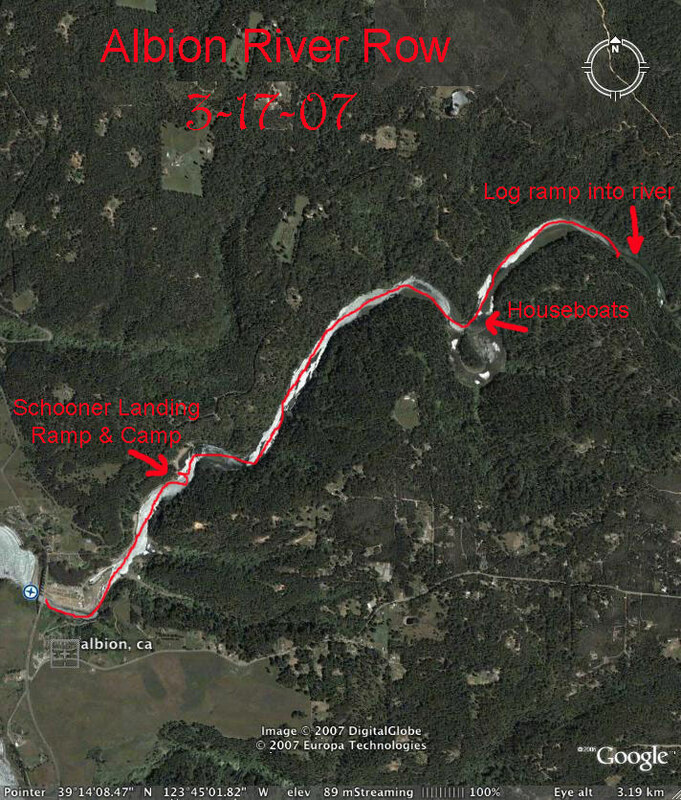 Some other folks had the date wrong also, and we kept up the tradition with evening toasts and lots of boating.As I was loading up to launch, a fellow paddled over to report a fire at the bluff by the campsite -- the stump we use as a flagpole base was burning, along with some nearby shrubs. 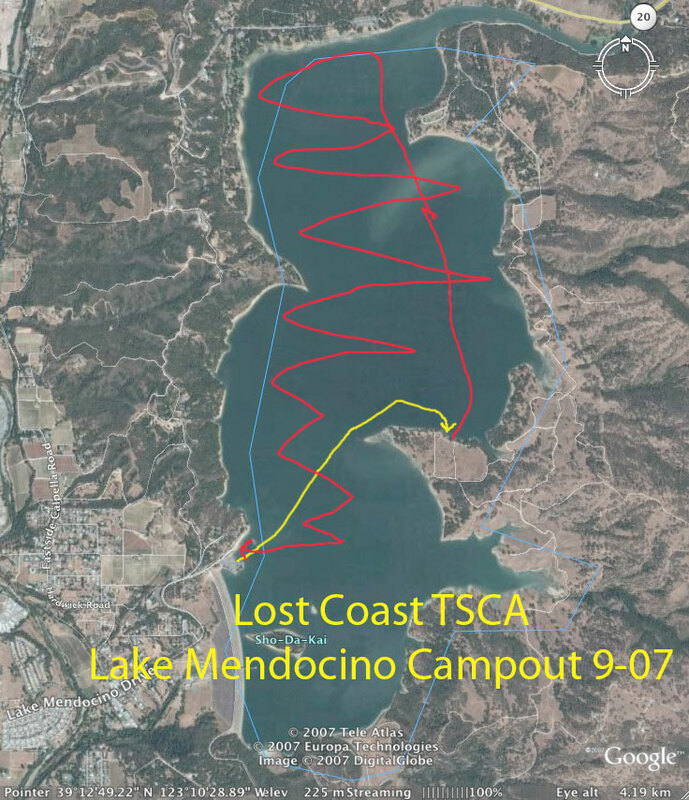 The local firecrews declined my offer to have them row my boat over, but hiked across instead and spent a lot of time putting it completely out. 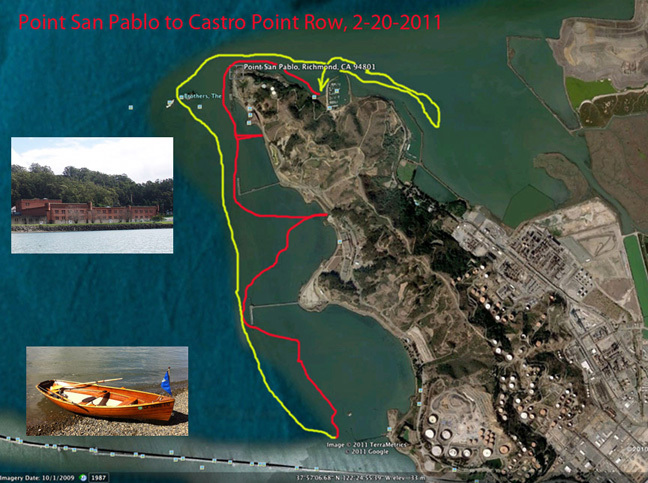 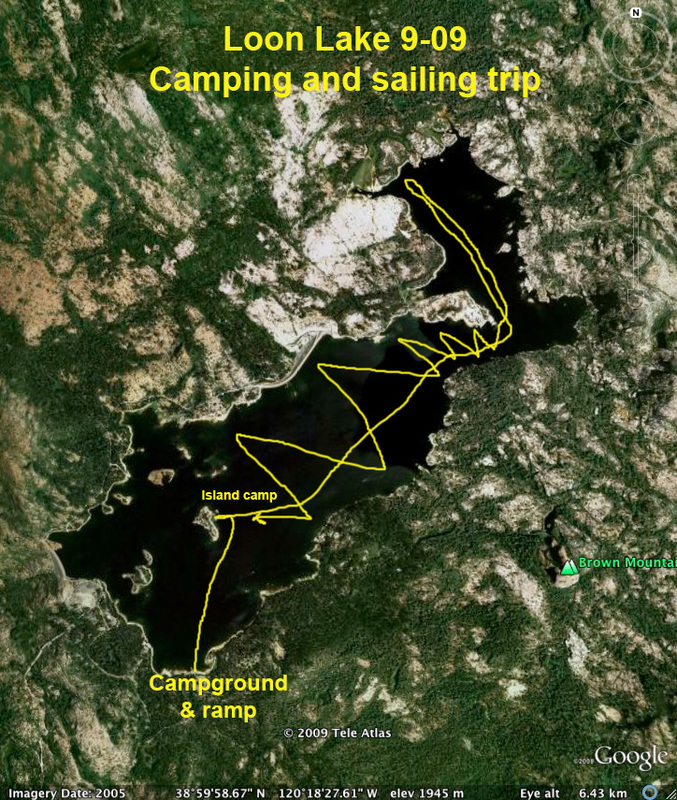 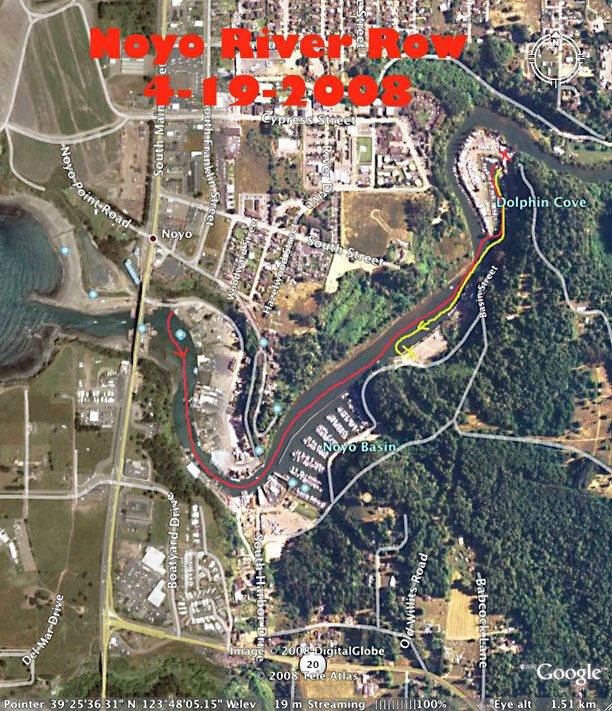 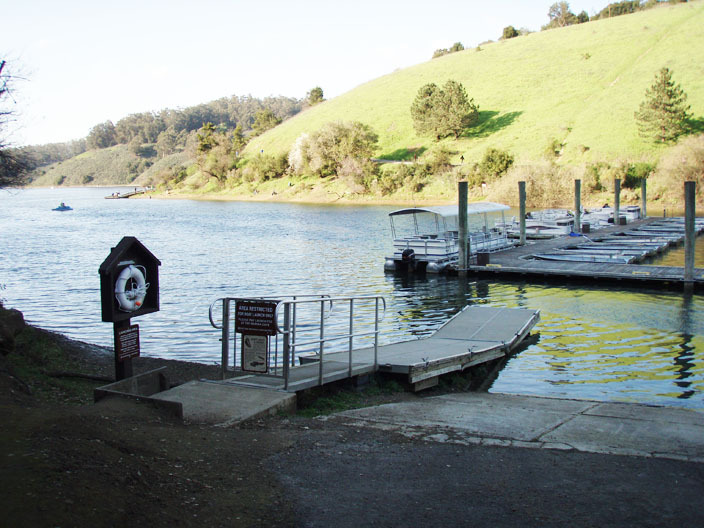 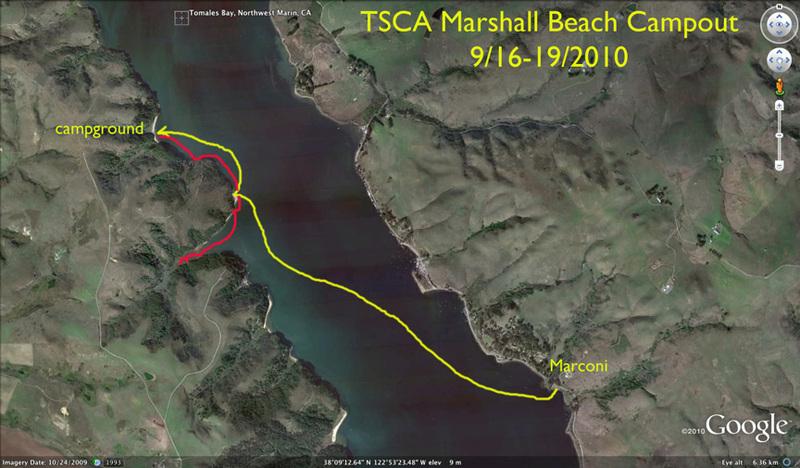 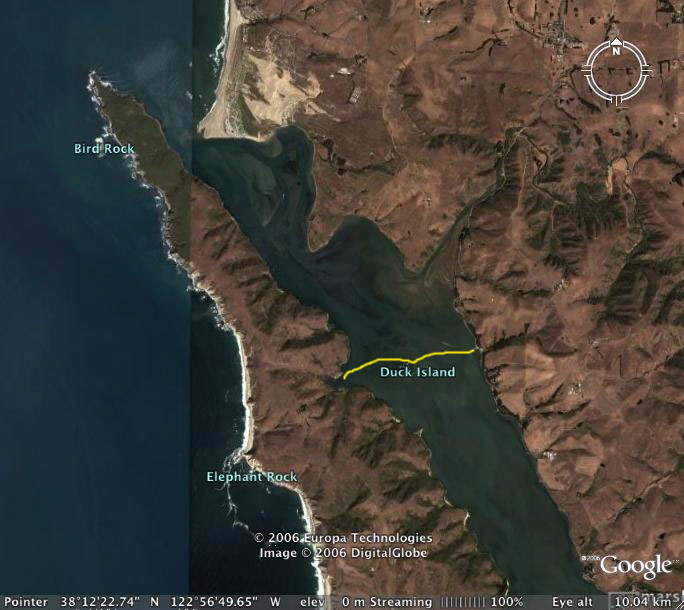 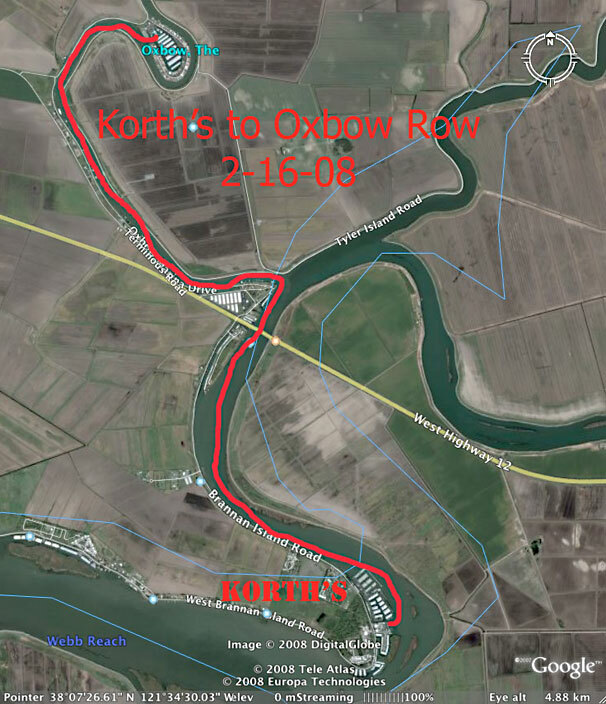 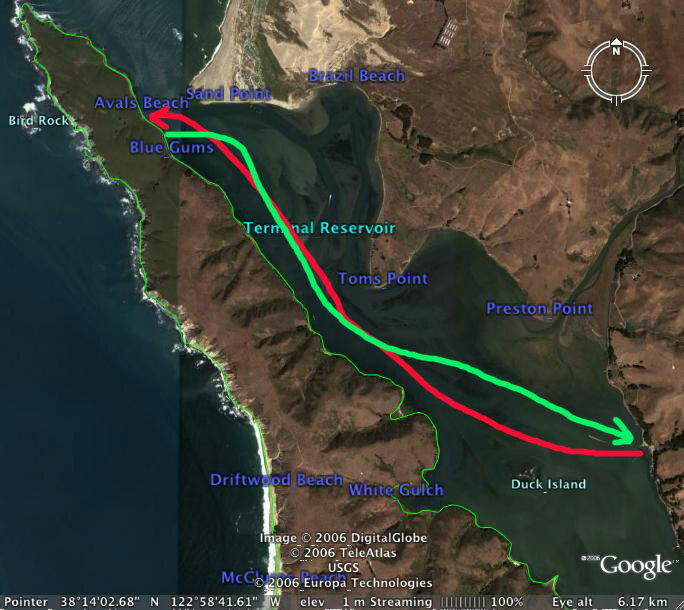 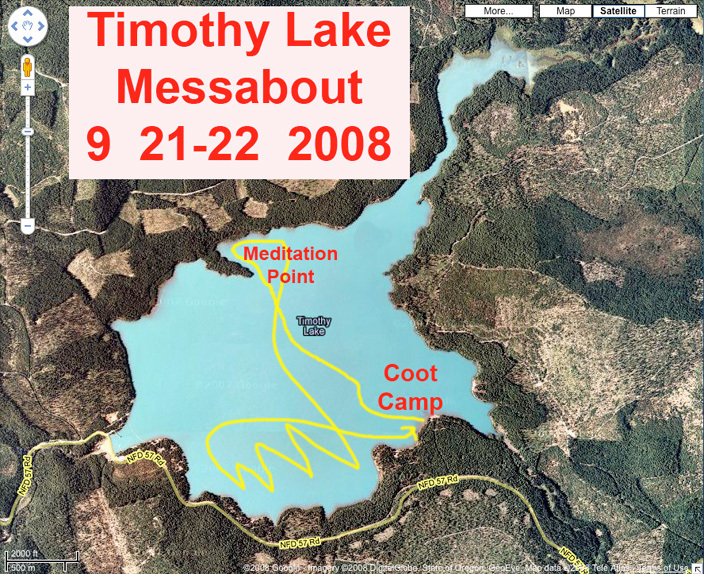 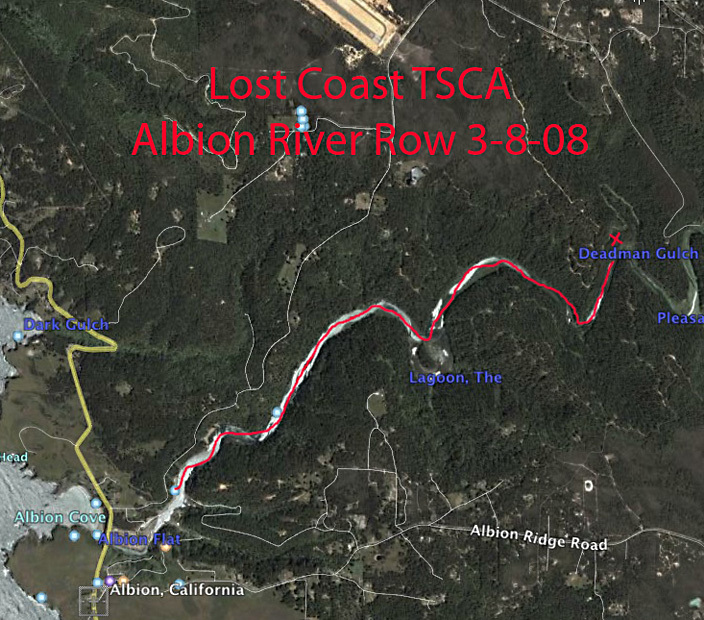 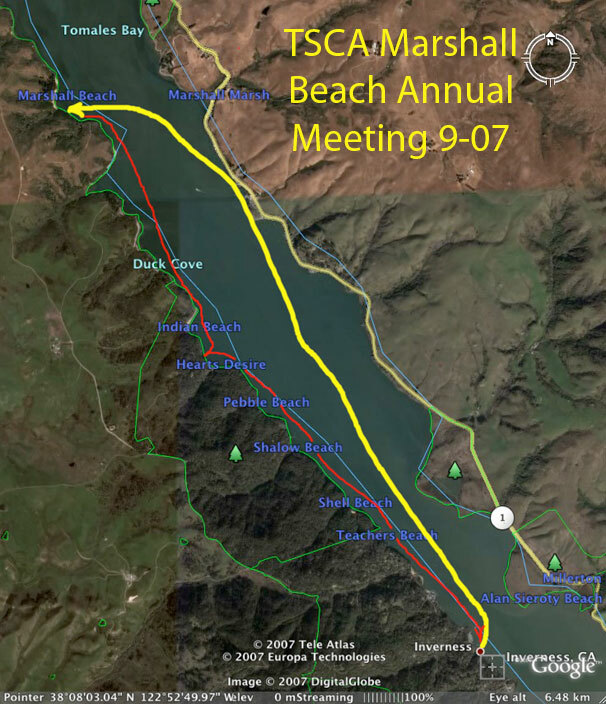 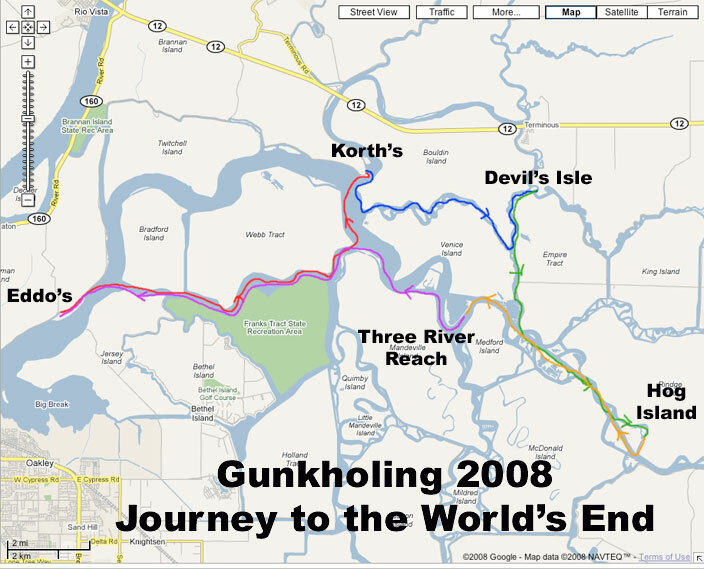 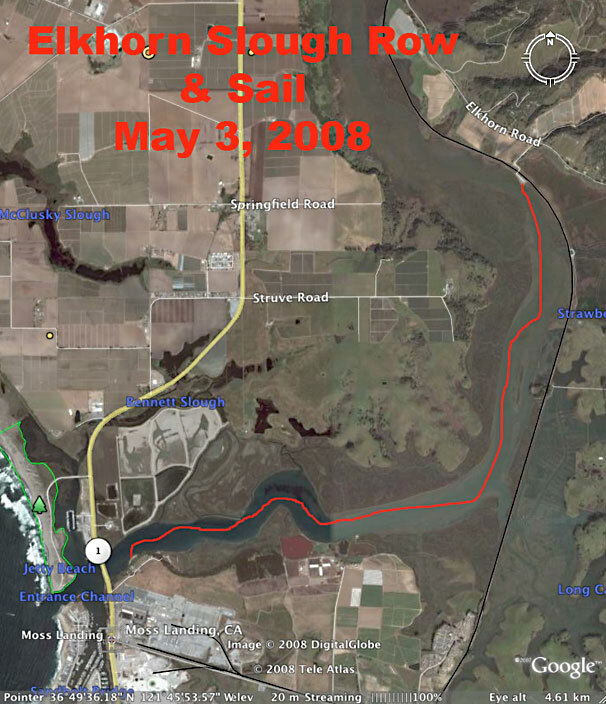 The route of the TSCA Tomales Bay Row, Sept 2006. 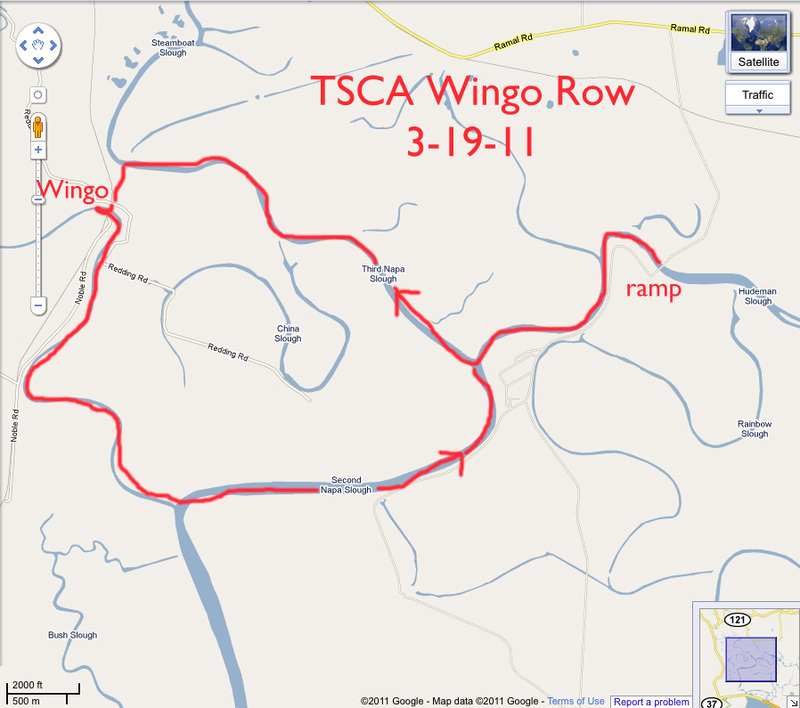 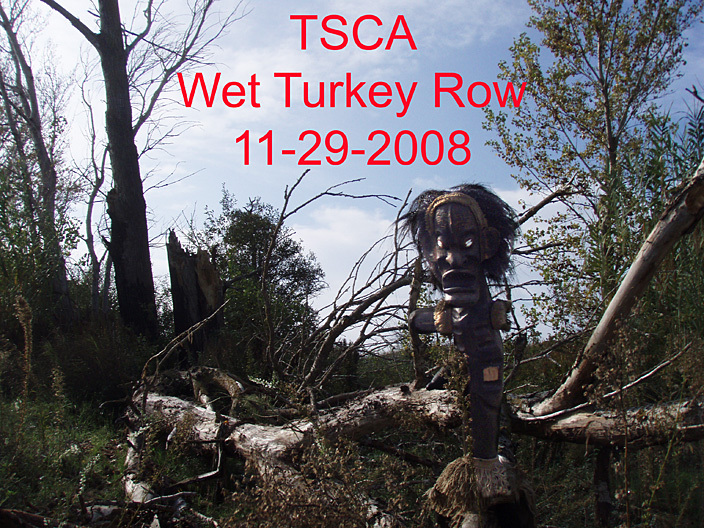 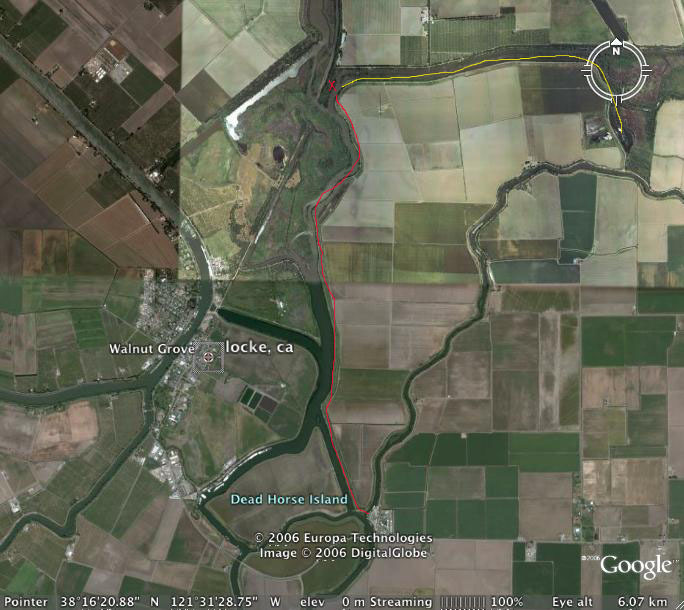 The route of the TSCA Delta Meadows Row, Oct, 2006. 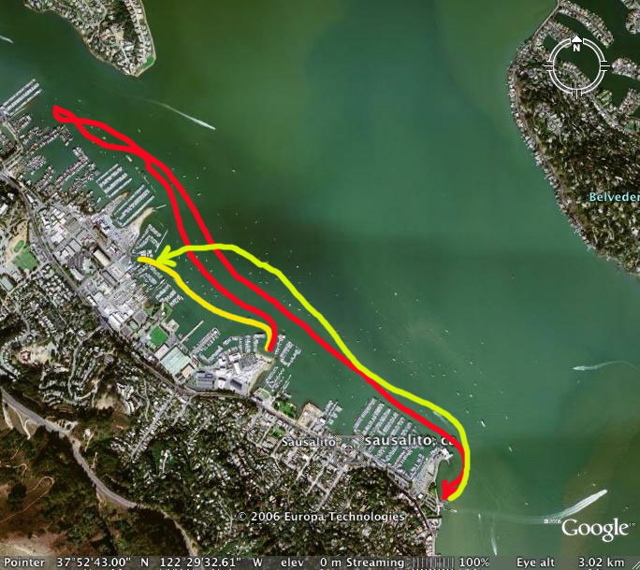 Main trip in red, my lost wanderings in Lost Slough in yellow.